During Chuseok (Korean Thanksgiving Day), the years harvested grains and fruits accentuate the flavor of some Korean food. Although there are many tasty treats or dishes during the harvest season, the one that stands out above all else is songpyeon, traditional Chuseok rice cakes. You'd be surprised to find that there are many different types of songpyeon. It's considered quite special, considering the amount of work that goes into making songpyeon. The half-moon shaped rice cakes are made by kneading rice flour using hot water and mung beans, and green soybeans and sesame are used as ingredients for the filling. Songpyeon is then steamed in a layer of pine needles, leaving a pattern on the finished songpyeon, along with an appetizing scent. As mentioned before, there are many different types of songpyeon such as oryeo songpyeon made of new rice, nobi songpyeon made of ramie leaves, acorn songpyeon, clam songpeyon, pumpkin songpyeon, potato songpyeon, flower songpyeon, arrowroot songpyeon and sagebrush songpyeon, among many others. Songpyeon that are usually eaten during Chuseok and made with new or this current year's crop of rice are called oryeo songpyeon. In preparation, pine needles are picked and cleaned a few days prior to Chuseok. After all the necessary steps, rice cakes that have been filled and prepared are steamed in an earthenware steamer. The finished product will have a faint but fragrant scent, along with a deliciously chewy texture that makes for a mixture of flavors and sublime tastes. Acorn songpyeon contains the true flavor of the Gangwon-do region. Traditionally, people from the mountainous regions of Gangwon-do stopped eating the acorn because of its bitter taste and, after using a grinding stone to make the starch, small leaves of an oak tree, along with rice flour, were mixed and used as fillings. They also mixed the filling or stuffing with rice cake and steamed it. For clam songpyeon, while not much different from the traditional songpyeon, the rice cake dough is made into small white shapes of short-necked clams. Residents of the Pyeongan-do region are known to enjoy this delicacy. Pumpkin songpyeon is made with pumpkins harvested during the autumn season. Pumpkins are sliced, dried and ground into powder. Then, the pumpkin powder is mixed with rice powder and steamed chestnuts or roasted sesame seeds to make the filling, and then steamed. Pumpkin songpyeon is sweet and tasty but also visually appealing, since the bright yellow color of the pumpkin shows through the semi-translucent steamed songpyeon. Flower songpyeon is made with omija (or the dried red fruit of Maximowiczia typica), gardenia seeds, pine endodermis and mugwort (or Artemisia), and therefore has a variety of flavors and colors. Flower songpyeon are known to be made with five cardinal colors and also have decorations made with various colored dough. 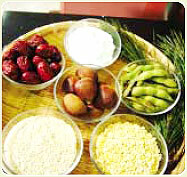 Names of these songpyeon vary according to their ingredients. 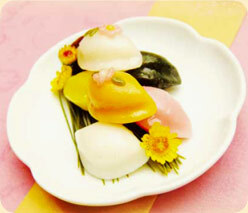 Flower songpyeon is classified along with other songpyeon made with rice powder, however. It's unique in a way because after the rice powder is kneaded into a dough and flattened, a variety of ingredients are stuffed into the flat half-moon shaped dough, and since the shape of the finished songpyeon is the same as your standard half-moon shaped songpyeon, it's classified as such. Songpyeon are tasty treats usually enjoyed during Chuseok, and there are reasons for this. Songpyeon are stuffed with ingredients made from red beans and other kinds of beans, and are meant to symbolize a wish fulfillment of one's knowledge or studies. The five cardinal colored songpyeon are supposed to represent vitality or energy, and the five basic elements that make up our universe. Omija is used to make the color red, gardenia seeds for yellow, Artemisia for green and pine endodermis for brown. Furthermore, maehwa songpyeon, which are made without fillings, are supposed to signify the desire for knowledge, as well as a wish for an exemplary attitude and outlook on life. Koreans have a tradition of gathering together to enjoy meals and spend some quality time together during the harvest moon festival when the full moon is at its brightest and highest point. Its also a time to be thankful for the abundance of the seasons harvest. 1. Wash non-glutinous rice 3 to 4 times and leave it soaking in water for 8 to 12 hours. Remove the soaked rice from water and sprinkle some salt and grind into a fine powder. Place the Artemisia in boiling water with salt, remove and then chop into fine pieces. 2. Take the powder for the rice cake and divide into 4 parts. Leave one part as it is, another part for the Artemisia. As for the other two parts, mix one with water from pine endodermis, and mix the last part with omija juice and knead it to make dough. 3. Peel chestnuts and cut into 3 or 4 pieces, include some sugar and steam lightly. Take the young soybeans, peel and add a bit of salt. Wash the sesame and when dry, roast and then mix with honey. Take the red beans that have been soaked in water, boil and then grind and mix with honey, salt, cinnamon powder to make the filling. 4. Take little pieces of the prepared dough. Press your thumb into the middle of the piece to make a round, flat piece. Place enough filling in the middle, fold and press the ends to make nicely-shaped songpyeon. Next, wash the pine needles and then dry. 5. In an earthenware steamer, place pine needles on the surface of the steamer and songpyeon on top. Stack more pine needles and repeat the process to add as many layers of songpyeon in the steamer as possible. When you see steam evaporating, place the cover on top. Next, take the pine needles out, dip songpyeon in cold water, rinse quickly and apply some sesame oil. Songpyeon that's not yet been steamed should be covered with a thin damp cloth to prevent the dough from drying or cracking. Potatoes, sweet potatoes and acorns, among other ingredients, can be used as the dough. For the filling or stuffing, black beans, mung beans, chestnuts, jujube, sesame or sweet potatoes are used. If you dont plan on eating the steamed songpyeon right away. Rinse it with the pine needles (not in cold water), keep them covered in a basket.